HVAC installation in the United States is easy as thermostats all utilise a universal standard and as such can be replaced easily by a 3rd party thermostat such as Control4’s thermostat. Unfortunately HVAC manufacturers outside of the United States do not always utilise this standard and some countries like Australia and New Zealand have proprietary RS485 based bus’s that are specific to the HVAC manufacturer and model. This makes it extremely cumbersome for Control4 dealers to source a reliable HVAC product and in many countries Control4 dealers do not even bother with HVAC integration because it is just too hard. Luckily Daikin has released its SkyFi module for their Daikin Ducted, Sky Air and certain VRV indoor units (with P1 and P2 terminals). Unlike other solutions this unit is manufactured by Daikin and as such will not void the warranty of the HVAC system should you connect it to their bus. It is also extremely cost effective making integration of HVAC to Control4 so affordable that integration of HVAC becomes a no brainer. 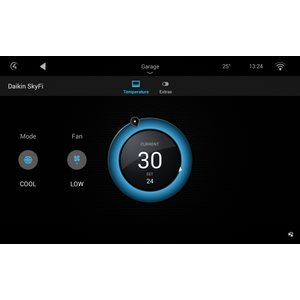 The Chowmain Daikin SkyFi driver integrates the SkyFi module and provides full 2 way control over temperature, HVAC mode, setpoint, fan speed, timer functions and zone control. Setup of hardware and driver should take you no more than 30 minutes once you get the hang of it. Timer Function (Turn on system in x hours and off in x hours). Ability to program On/Off and Zone commands via programming tab. Filter Clean Notification on Navigator. * If fitted to the HVAC system. 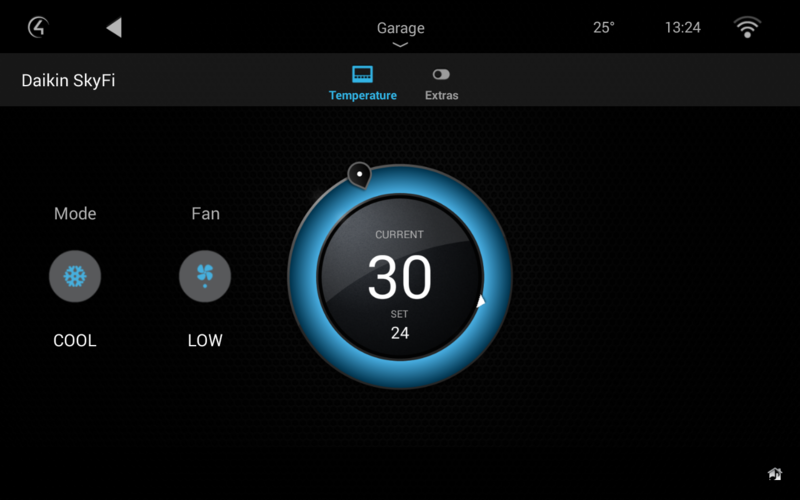 In Australia and New Zealand (and other countries) HVAC integration has been hard because HVAC companies do not utilise the honeywell based wiring that most smart thermostats like Nest, Control4 and Honeywell use. In order to integrate HVAC you had to install commercial grade HVAC solutions and get additional modules. There was no definitive and easy way to know if a HVAC solution was going to work without consulting a HVAC installer. To put it simple it was just too hard and too expensive to integrate HVAC. Now with the SkiFi module installers can now easily integrate Daikin based Ducted and Cassette based HVAC systems into Control4. The module is extremely affordable and will not void Daikin's manufacturer warranty on the HVAC system. This module is even backwards compatible with systems dated back to 2003. So dealers can now revisit old customers with compatible Daikin HVAC systems to upgrade their home automation system and integrate their HVAC system. What HVAC systems can i use the SkyFi with? The SkyFi module is developed by Daikin for their Ducted, Ducted with Zone Control and Cassette/Under Ceiling based HVAC systems. The SkyFi module will also work with VRV indoor systems with the P1-P2 terminals for a wired remote control. This should work with any of these systems that are manufacturered after 2003. Please contact Daikin to confirm if your HVAC system will be compatible if in doubt. NOTE. This module will not work with Daikin Split HVAC systems. For Split HVAC systems see our Daikin Wifi Driver. Can i control zones with this? This module will allow for zone damper open and close via the Extras tab with 2 way feedback. The driver will pull in the zone names on first setup. Please name the zones using the official Daikin SkyFi application prior to installing the driver. Can i get individual temperature readings per zone? The Daikin Skyfi unit provides a single temperature reading for feedback. It does not provide individual zone readings. This is a limitation of the hardware. Can i do schedule the HVAC system using this? 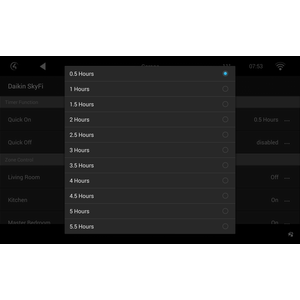 The SkyFi module offers basic timer based on/off functionality. This functionality is included with the driver on the Extras tab in the driver's navigator interface and is designed to mimic the SkyFi smart phone application. 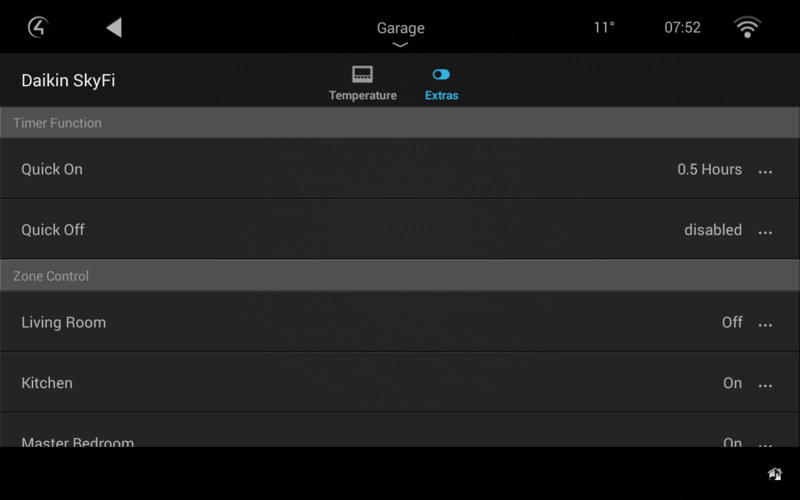 You can also utilise Control4's wakeup agent or scheduler in Composer Home Edition. Why do you only support OS 2.7 and above? This driver requires functionality that is only available in OS 2.7. As such this driver will not work in earlier versions of Control4 OS. Attempt fix for extras tab disappearing. Added customisable HVAC and Fan modes. 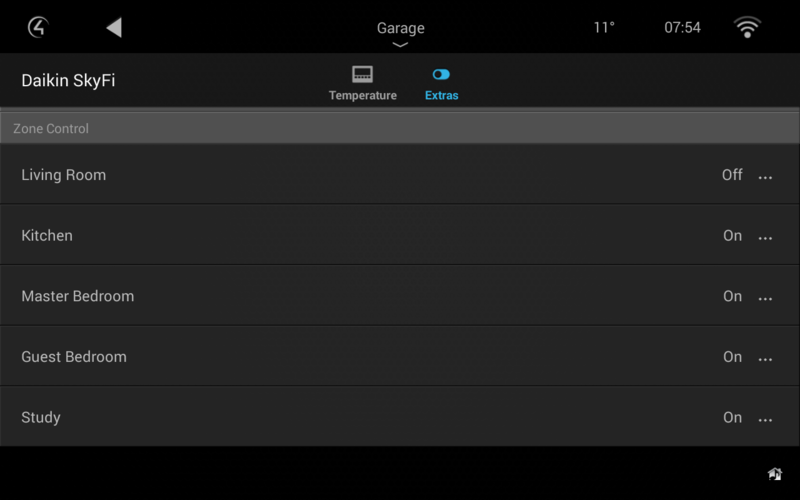 This is so that you can remove modes that are not available in your system. Removed HEAT/AUTO, COOL/AUTO, LOW/AUTO, MEDIUM/AUTO & HIGH/AUTO. Turns out these modes are just Auto with hvac mode and fan speed feedback at the same time. Changed Zone Control from Switch to List based options due to bug in 2.8.2 T3 Switch button not sending proxy command (seems to work fine on every other navigator). May change it back later in a later OS version if this is fixed.